Continuously operating reference stations (CORS) are increasingly used to deliver real-time and near-real-time precise positioning services on a regional basis. A CORS network-based data processing system uses either or both of the two types of measurements: (1) ambiguity-resolved double-differenced (DD) phase measurements, and (2) phase bias calibrated zero-differenced (ZD) phase measurements. This paper describes generalized, network-based geometry-free models for three carrier ambiguity resolution (TCAR) and phase bias estimation with DD and ZD code and phase measurements. First, the geometry-free TCAR models are constructed with two Extra-Widelane (EWL)/Widelane (WL) virtual observables to allow for rapid ambiguity resolution (AR) for DD phase measurements without distance constraints. With an ambiguity-resolved WL phase measurement and the ionospheric estimate derived from the two EWL observables, an additional geometry-free equation is formed for the third virtual observable linearly independent of the previous two. AR with the third geometry-free model requires a longer period of observations for averaging than the first two, but is also distance-independent. A more general formulation of the geometry-free model for a baseline or network is also introduced, where all the DD ambiguities can be more rigorously resolved using the LAMBDA method. Second, the geometry-free models for calibration of three carrier phase biases of ZD phase measurements are similarly defined for selected virtual observables. A network adjustment procedure is then used to improve the ZD phase biases with known DD integer constraints. 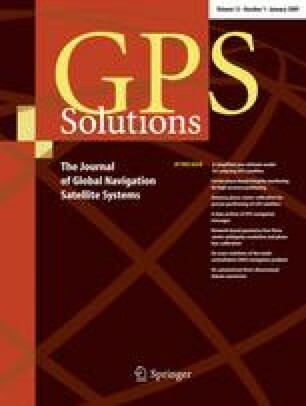 Numerical results from experiments with 24-h dual-frequency GPS data from three US CORS stations baseline lengths of 21, 56 and 74 km confirm the theoretical predictions concerning AR reliability of the network-based geometry-free algorithms. This work was carried out with financial support from the Cooperative Research Centre for Spatial Information (CRCSI) project 1.4—“Delivering precise positioning services in regional areas”, 2007–2010.